Both Fluke and Flounder are flat, bottom dwelling fish that live in the waters off Long Island. For those of you who like to get out there and fish these waters, these are fish that make for good eating, and generally speaking, are just not equipped to put up much of a fight. 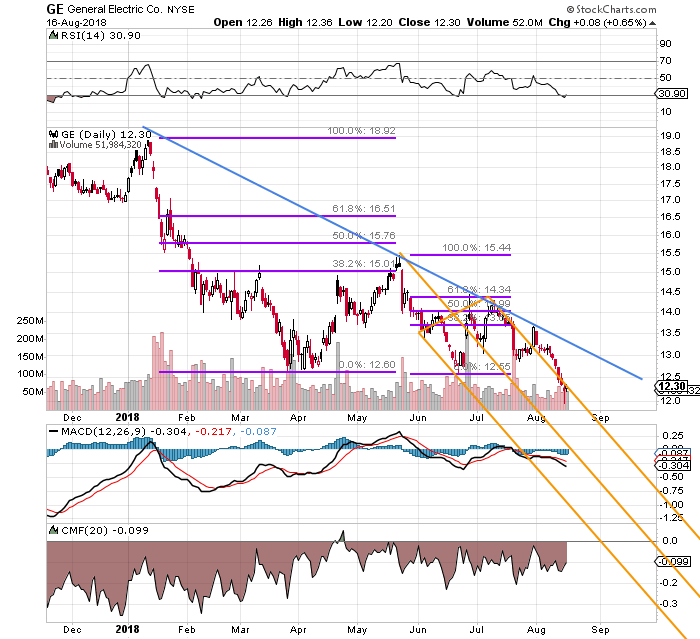 General Electric (GE - Get Report) is another bottom dweller that seems ill equipped to put up much of a fight. That's not a shot at CEO John Flannery. I think he is digging in and putting up a tremendous effort to save a firm left to him in a horrendous position. The stock though... (shaking my head). The stock's performance would look at the term "flat" as a serious positive. I am long General Electric. I hate being long General Electric. Bottom fishing is not the sport that it's made out to be. Even at these current prices -- the stock closed at $12.30 on Thursday, after trading as low as 11.94 (a nine-year low!) on Wednesday -- I am not likely to add to this position. Two years ago, after Warren Buffett's Berkshire Hathaway (BRK.B - Get Report) made its exit from the name, I got in. Hey, big seller out of the way. What could possibly go wrong? Well, I spent about a year and a half managing that position. I did get out in May with my capital investment whole, but it took much of my time and energy. It also took adding a ton of risk in sports that I am comfortable with, such as the sale of both puts and calls, as well as coming close to overplaying my hand in sports that I don't like so much. It's called adding on weakness when you believe in a stock. It's called dollar cost averaging when you go for it on fourth down. GE continues to shed business units despite announcing that the $20 billion divestiture target had been substantially completed last month. Is the firm simpler and stronger as promised? Well, it's still a long way from simpler, and stronger is anybody's guess. The separation of the Baker Hughes (BHGE - Get Report) oil services unit still lies in the future.